There comes a time when your guitar collection gets a little bit too valuable to leave lying around the house unprotected. Guitars can be expensive and delicate and too often an open invitation for burglars. How exactly do you go about protecting them though? Usually they are too big and awkward for a conventional safe and even require some humidity and temperature control. Fortunately, guitar safes are very popular popular and widely available but they usually go by a different name: rifle safes. Yep, with a few small modifications you can turn a regular rifle safe into the perfect guitar safe and not have to worry anymore about your vintage Les Paul being stolen by a fortunate thief. Here we’ll look at just how to go about storing guitars in a rifle safe and some optional modifications you can make. The first thing you’ll need to think about is how much space you need and find a rifle safe that corresponds to your needs. For the most part you can find rifle safes in all sorts of sizes but the standard is usually 2-3 feet wide and 5 feet tall. This should fit 4 or 5 electric guitar pretty easily. One important thing to be careful of is the depth of the safe. Make sure it’s deep enough to accommodate your biggest guitar. An optional modification that you can make is simple padded dividers though this isn’t totally necessary. This can be done as a custom modification by the safe company of by yourself with some simple upholstered plywood fastened to the inside of the safe. Additionally, since you’ll have some extra headroom you can use it for general music equipment storage and likely fit in a small amp or two and some pedals or microphones. So, the bad news is that even a primo fire rating on your safe will likely not be enough to totally protect your guitar from damage. At least it’s got a better chance inside a fire rated safe than sitting in your burning apartment. While there’s a lot of different ratings the most common for a gun safe will maintain an internal temperature around 300-350 degree Fahrenheit, which at the very least, will keep your guitars intact with some reparable damage to the electronics. It’s not a perfect solution but your guitars will survive though likely not in pristine condition. If you have priceless instruments the best option may be insurance or a custom built safe with an incredible fire rating if you’ve got the cash for it. 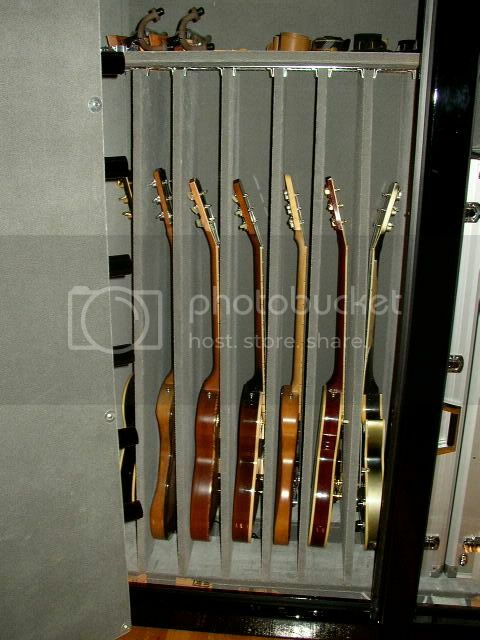 When keeping your guitars in a safe there are a few basic concerns that you should be aware of. The first is humidity. High levels of humidity will damage a guitar over time and is a pretty easy fix. There are a number of options that will suffice: an electronic dehumidifier, desiccant packs, or even cat litter in a pinch. Additionally, temperature control is important and also relatively easy to control. You want to avoid drastic swings in temperature as well as extreme highs and lows. This is a problem that usually takes care of itself. If your home has a livable room temperature you should be fine and the thick walls of a safe should offer some basic insulation and protection against temperature swings. The post Guitar Safes appeared first on Gun Safes & Wall Safe Brands for Sale.